Gobi Coal & Energy has announced its 100% stock acquisition of Zaraiya Holdings Ltd, which wholly owns an advanced in-situ leach uranium project in Mongolia, adjacent to AREVA. 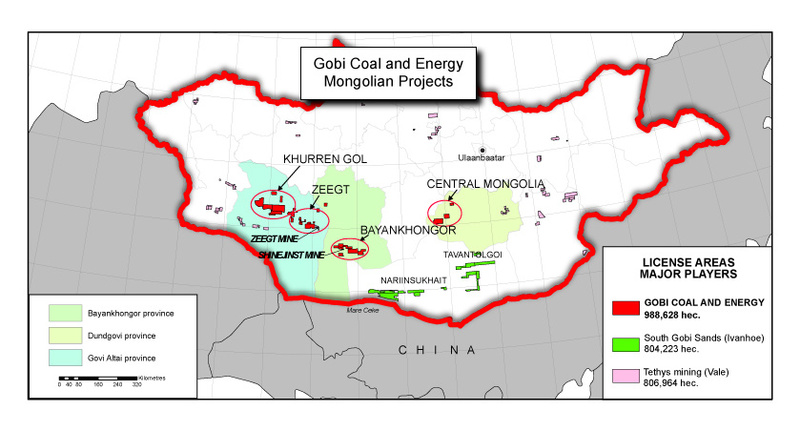 The acquisition is expected to complete in March and demonstrates Gobi Coal’s progress towards becoming a diversified multi-national energy resources company focused on high value projects. As part of this strategy, Gobi Coal plans to rename itself Zaraiya Energy Resources Ltd and is moving forward with a public listing along with an associated capital raise of up to US$10 million. The combined company benefits from nearly US$200 million of investment in three high-grade metallurgical coal mines in Mongolia containing 318 million t of JORC resources and the advanced in-situ leach uranium project having at least 20 million pounds of existing resource potential and up to 50 million pounds of resource potential following planned land acquisitions currently under discussion. The primary metallurgical coal mine in southwest Mongoliais pre-stripped and production ready with peak production potential of 6+ million tons per annum of semi-soft and hard coking coal and coal seams as wide as 44 m.
During the last several years, Gobi Coal successfully preserved its metallurgical coal mines through the recent sharp recovery in metallurgical coal prices during 2016. With market prices for Shandong semi-soft and Liulin hard coking coal finishing the 2016 year at RMB 1000 (US$145) and RMB 1600 (US$232), respectively, the economic value of the Gobi Coal mines has returned to near peak levels. This has allowed Gobi Coal to progress plans for the development of a railway from Shinejinst to the China border with a view to reaching full metallurgical coal production as soon as 2019. At the same time, the long-term potential for uranium has strengthened significantly. China has a reported 30 reactors in operation, 24 new reactors under construction, 40 reactors planned, and 136 reactors proposed, together which will result in a three-fold increase in its nuclear capacity by 2020-21. The UAE through the Emirates Nuclear Energy Corporation is leading one of the most advanced nuclear energy construction programs worldwide that reached 76% overall construction completion at the end of 2016. Reactors in operation worldwide today are already consuming in excess of 10 000 tpy of uranium more than current global mine production capacity. This supply-demand imbalance is expected to grow sharply as numerous new reactors enter operation. As of the end of 2016, Gobi Coal had cash receivables of US$18 million and no debt.